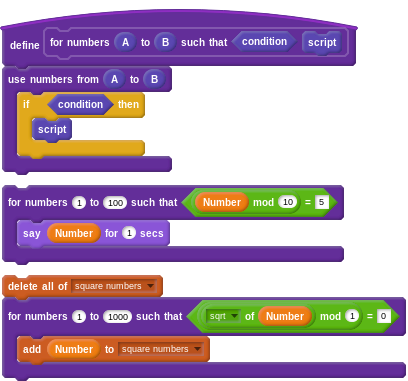 Scratch custom blocks have always been a powerful way of simplifying code. 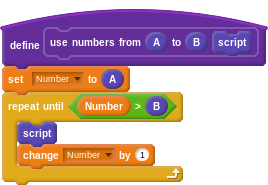 They reduce the amount of duplicate code in a sprite by allowing you to reuse a procedure; text/number and boolean inputs complement this by letting you give specific values to the blocks in the procedure. 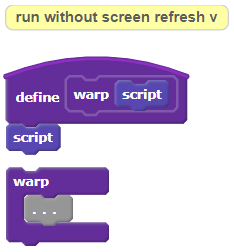 They even allow for some neat and convenient programming tricks by way of recursion (that is, you can call a custom block from within the definition of that custom block) and "run without screen refresh" (an option that makes the custom block evaluate as quickly as possible, not allowing any other scripts to run at the same time). 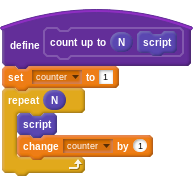 Of course, Scratch custom blocks are based on the "procedures" (or "functions") feature found in nearly all programming languages, which also feature inputs/parameters and recursion. However, procedures in many "professional" programming languages allow for a particularly unique idea absent from Scratch: creating custom control structures. Indeed, writing this was as simple as replacing the "say (Number) for 1 secs" with a block-shaped input. Update December 14: Be sure to take a look at this additional section proposing custom block "outputs", as well as the immediately-below comment with interesting examples of custom C-blocks! PPS, here are some example use cases. 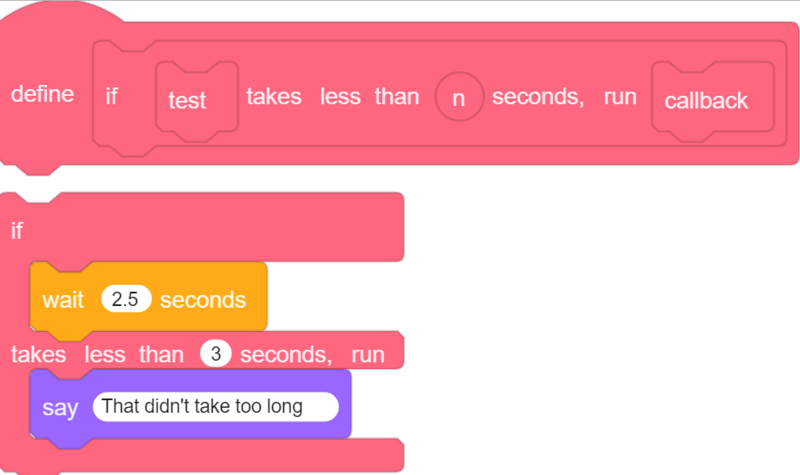 Of course, there's endless more possibilities, but hopefully these demos should get you started thinking about what you could do with C-shape custom blocks. 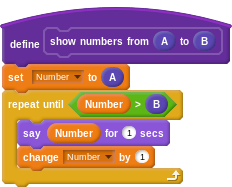 @joker314 I did think about E-shape blocks (etc) while writing this suggestion, but I decided not to include them because they "raise the floor" a lot (so, high-floor instead of low-floor). 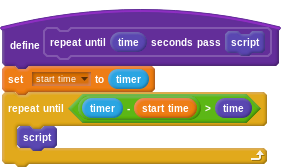 As you can see, the "while" block is an actual C-shape, which is how it will display in the block palette. This matches how the "placeholder block" in current custom blocks match how the block will actually display in the block palette. If this were to be implemented, that definition would appear in every project with any frame complexity. @Kenny2github I wouldn't say that would be the most exciting new use of it (since you could more or less just use a separate custom block for each "run without screen refresh" thing), but it would for sure be helpful, yeah! Thanks for the example. I wanted to bring up an important topic to consider when thinking about custom C-blocks - particularly ones which manipulate variables. Can you see what's happening? The inner loop is manipulating the counter variable - which is also used by the outer loop! This idea of custom block outputs can be explored in a lot of different ways to make it as intuitive and useful as possible, but I've explained the gist of the idea and how it can be used to make custom C-blocks realistically useful by avoiding the problems described above. 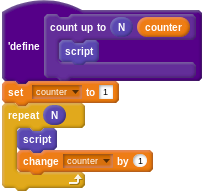 Is 'counter' available in the variable drop-down menu of the 'set variable' block even if that block is not inside of the C-block yet? If not, it might make the output variables less intuitive (some users may look through the drop-down menu of the 'set variable' block in the palette before dragging it out)? But if yes, then it's easy to make a mistake and set a variable not in your 'scope' (would this actually change the variable, or be ignored?). If they actually do set the (out of scope... or not! 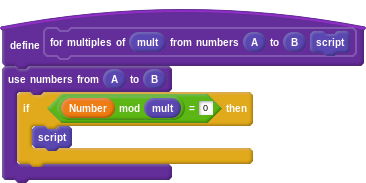 variable), then two C-blocks can't have the same names as each other or it'd be ambiguous. Can the output variables be monitored on the stage, perhaps via right click?